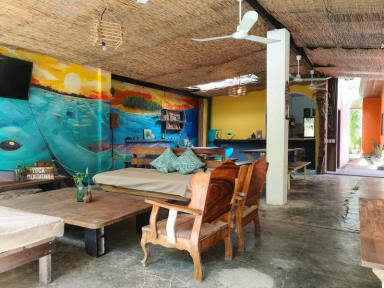 Really cool Hostal right at the beach. Its a nice place to relax, surf and meet new people. Could have stayed here for a long time. The people working here are really nice and help with everything. Supermarket and Surfboard-Rental are close by. Defintely would come here again. One of the best hostels i'ver ever stayed in. Friendly staff, nice facilities and perfect location. Highly recommendable. Thanks for hosting us! Super stimmung und nette leute. Leider war mein zimmer dauerfeucht und deshalb haben die kleider angefangen zu schimmeln. Das problem sei aber bekannt und sie werden wohl demnächst was dagegen tun. The rooms do not look quite as good as in the pictures. Nevertheless the hostel has a nice atmosphere and amazing location next to the beach! We enjoyed the common area and hammocks all over the site. One thing we didn’t like was the kitchen and the cleanliness...it all could have been a bit better. All in all we would still recommend it! 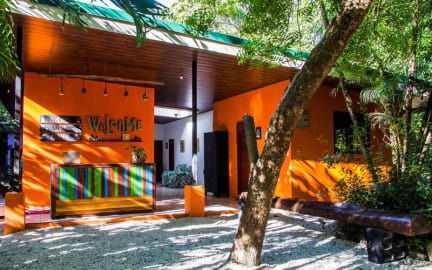 If you surf this hostel might be awesome for you... right at the beach with a good atmosphere. If you don’t you are not that lucky. It is quite a walk to the bank e.g and staff can’t offer you much information about what to do... I ask for advice at the Selena next door. Beds were clean but the rest needs some improvement. The atmosphere was super nice. The rooms are not as spacious as it might look on the images, you can’t lock the rooms, and the kitchen definitely needs some maintenance and cleaning / new equipment. Other than that I really enjoyed my stay and with a few improvements I would definitely come back. Hostel is directly located at the beach, which is really nice. Beds were comply however the room smelled a little moldy. Kitchen and Fridge could have been definitely cleaner. Thought it is a little bit overpriced. No breakfast included. All things you need are around.